Thanks, Joe. In my life, I’ve known more supportive, gentle men than the self-centered horrors depicted in these few writings, and I know that in addition to the fact that men, too, have been abducted, tortured and killed, that in being expected to go to war, men (and now women) have traditionally faced horrors of being forced to kill or be killed as well. Joe, I think I’m going to post your letter and my reply to you. 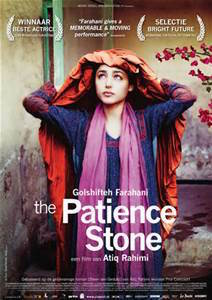 I would love to have more people see “The Patience Stone” and then to hear their discussion of the film. If you can get beyond the horrible subtitles–-and in places I was grateful for the humor they infused which appropriate or not, helped to lighten things up a bit-–this is one of the best films I’ve ever seen in terms of getting a point across that you had to dig for a bit. See a trailer for “The Patience Stone” HERE. See the entire movie online HERE. This entry was posted in Film Reviews, Films and tagged Afghanistan, art films, favorite films, Film Reviews, films, foreign films, The Patience Stone on August 25, 2015 by lifelessons. The Nickelodeon Theater in Santa Cruz, CA, is the only theater I’ve ever known where one can literally just show up and watch whatever movie is coming up next and not be disappointed. (And unlike most modern theaters, starting times for movies are staggered so no matter what time one arrives, it is never necessary to wait longer than 20 or 30 minutes for a movie to start.) An old building with some of the viewing rooms so small that they only accommodate 60 people, others the size of a regular small theater, they show foreign and independent films as well as films suggested by viewers in a big book left in the lobby for customers to record their comments. Santa Cruz is a small town on the ocean where new hippies are still being born—a town whose university is built on a mountainside covered with redwood trees. The school boasts an organic farm, a succulent garden, and running tracks where joggers are known to have encountered jaguars. It is the town where deadheads used to hang out between tours and where a local restauranteer went to jail countless times for opening up a free soup kitchen for the homeless on the street and another man went to jail for routinely putting quarters in the lapsed parking meters of strangers. Obviously, the town government was not always in sync with the thoughts of its citizens, but the Nick always was. This is where I watched “My Life as a Dog” and “Bagdad Cafe” three times each, as well as “Killer Klowns from Outer Space” and “The Lost Boys”—two bizarre little films shot in Santa Cruz and featuring familiar locations such as the boardwalk and beach. A small town girl who traveled for 4 years after graduating from college and who then moved to another small town, I had never lived in a town with alternative theaters until I moved to California, and although I had occasionally seen art and independent films, in an era before computers and savvy television made the whole world of film available to viewers, the Nickelodeon was a mind-expanding experience. Now I live in Mexico, where what foreign and art films are available tend to be dubbed in Spanish. Yes, one can get almost any film on one’s computer now, but it is not the same as sitting in a small room chuckling and crying, surrounded by an audience of 60-300 of one’s peers, munching giant tubs of popcorn covered with brewer’s yeast (offered in shakers right next to the salt)—a tub that comes along with promises of a free refill for those with an unlimited appetite for popped corn. A year after I Ieft Santa Cruz, The Nick bought the Del Mar—a regular theater with three much larger viewing rooms. That theater continued the tradition of showing movies unavailable in other venues and had the same policies, but the smaller theater continued to function and whenever I went back to Santa Cruz—once for a wedding and other times just to visit friends—it is the original theater I headed for. Some things just can’t be improved upon. The Nick has now expanded its family to include the Aptos Theater. All three theaters continue the tradition of showing wonderful indie, art and foreign films. I love Mexico, but other than friends from El Norte, the Nick is probably the thing I miss most about my former home. In a minute, it is the feature or landmark I’d choose first to have transported to Ajijic. I’d position it near our own malecón that runs along the lakeside near the pier and I would happily leave my own big screen Smart TV and drive for 15 minutes to join once again with others ready to be delighted by whatever offerings it presented. Daily Prompt: City Planners. If you could clone one element from another city you’ve visited — a building, a cultural institution, a common street food, etc. — and bring it back to your own hometown, what would it be? This entry was posted in Art films, CA, City Planning, Cult Classic Films, Daily Post, Essays, Indie Films, Indie Theaters, Movie Theaters, Other kinds of Loss, Writing and tagged art films, CA, Daily Post, Essays, foreign films, Indie Theaters, Judy Dykstra-Brown, Movies, Santa Cruz, The Nickelodeon on June 12, 2014 by lifelessons.